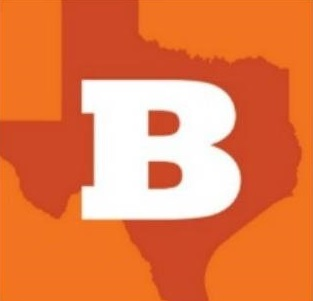 Orange you glad I'm no longer Governor? 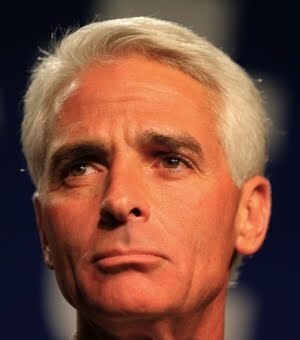 In 2006, Floridians elected a very friendly Ooompa-Loompa named Charlie Crist to be our Governor. Charlie was very, very popular. In fact, he was so popular, he was convinced that he was very special and the normal rules of politics did not apply to him. Charlie was elected as a Republican, but almost immediately turned to the left. Charlie and his friend George LeMieux told all the other Republicans that they needed to be more "moderate" and act more like the Democrats. While Charlie and George were trying with all of their might to steer our state to the left, some of the people who actually liked being Republicans pushed back. One of those people was Marco Rubio, who was the Speaker of the House. Charlie wasn't the only one with a friend. Marco had a friend named Adam Hasner, and Marco picked Adam to be the Majority Leader. Marco and Adam fought together against Charlie's liberal policies while they were both in the Legislature. Charlie did a lot of stuff to make conservatives unhappy. Then, in 2009, Charlie decided to run for Senate instead of running for re-election as Governor, and Marco ran against him. Marco's friend Adam supported him from Day One. At the beginning of the race, Charlie claimed he was a "Jeb Bush Republican" and a good conservative, but it didn't work. Charlie officially abandoned the party that he'd philosophically left years ago, and attacked Marco, saying he was "too conservative," and "too extreme." It didn't work. Then, Charlie tried snuggling up to Democrats, tried to bully Kendrick Meek out of the race. That didn't work either. Charlie ran a TV ad, claiming that as an independent, he was better than Democrats and Republicans. That also didn't work. Charlie chased after polls, did whatever focus groups and consultants told him to do, pretty much just blew around in the wind like a plastic bag, but nothing Charlie tried worked and Marco won the election. So now where are we today? Democrat Bill Nelson is up for re-election in 2012, and Republicans are starting to line up for the chance to challenge him. Some people have officially entered the race, some have exploratory committees, some are just talking about it, but no matter what, it's going to be an interesting primary. So who should we pick? Who's the best candidate? Well, in my opinion, I have been very impressed with what Marco Rubio has done since winning the election. Marco's done more than just vote the party line, he's been a voice for conservative principles. He's resisted the pressure of the media, K Street, and even the GOP leadership to stand strong and fight for what he believes in. He's been an especially strong advocate on fiscal issues. I've met Mike Haridopolos and George LeMieux several times. They're nice, friendly guys. But so was Charlie. I want more than nice. More importantly, with the problems our country is facing right now, we need more than nice: we need tough. Back when Adam Hasner was in the Legislature, battling with Charlie Crist, his position was (as it it today) that Republicans "don't need to be less partisan, we need to be more principled." I want a Senator who will go to Washington and stand strong, stick to conservative principles. I want a Senator who will refuse to cave under pressure. I want someone who knows what it means to be a conservative, someone who doesn't just know how to say the sound bites and slogans, but who carries the philosophy deep in their heart. I'm looking for a candidate who doesn't just say "I'm a conservative" because it's cool and trendy now, but who actually is a conservative. I want to be able to point at a track record, a voting history, and be satisfied that the overall scope of it is unequivocally, undoubtedly, unquestionably conservative. There's only one Marco Rubio. But he's one heckuva fantastic blueprint to follow for a conservative Senate candidate. Who better to send to the Senate to work with Rubio to fight against the liberal policies of Barack Obama and Harry Reid, than the very man who worked with Rubio to fight against the liberal policies of Charlie Crist and George LeMieux? 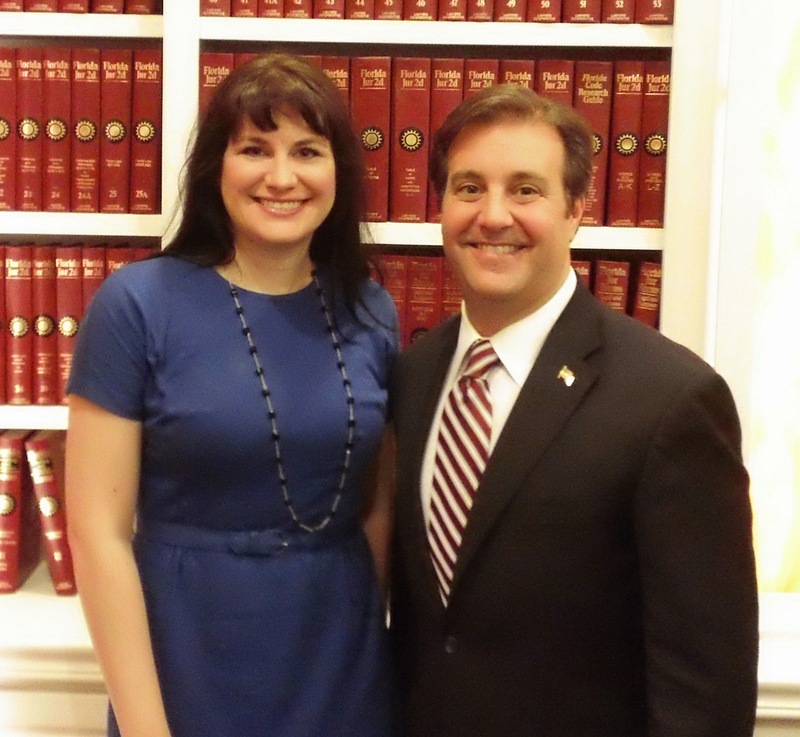 If you call yourself a conservative, then Adam Hasner is your candidate. As soon as he officially announces his candidacy, he will also officially have my endorsement. I support him enthusiastically and without reservation. Last night, Adam Hasner spoke at an event sponsored by the Eastern Orlando Tea Party and the Seminole County / Altamonte Springs Tea Party. I recorded the entire speech and want to share it with you so you can see for yourself. Adam Hasner - 04.06.2011 from Sunshine State Sarah on Vimeo. I can tell you this, this is not going to be an easy challenge to undertake...I'm going to be outraised and outspent. I know that some of them are going to try and reinvent themselves in 2012 as conservatives, after years and years and years of fighting against the conservative agenda. Why? Because now, it's actually popular to be a conservative. The good news for me is that in 2012, I don't have to reinvent myself as a conservative. I can go out with the same passion and the same energy that I have every year prior to talk about the issues and the challenges that we face. But I can't do it alone. I need your help. 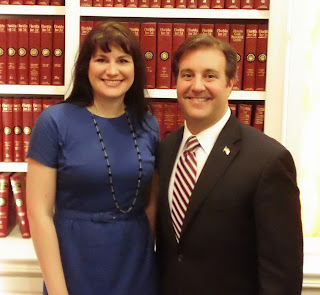 Adam Hasner, hopefully my next Senator! UPDATE: Since Adam Hasner has now officially declared his candidacy, he also officially has my enthusiastic endorsement. I met Adam Hasner when he was in town and liked what he had to say very much. Hope he gets in the race soon! Hasner is the best candidate in this race! Just say no to Frenchy and the Hair! Were you at the Tea Party @ Lake Eola last Friday? Yep. Another great event. Not sure why they let that joker Falconer up on stage, but other than that, it was fantastic. Adam Hasner has my vote.